Dan May refuses to prosecute the killers of Tom Clements out of fear? DirtyElder.com received additional evidence others were involved in the assassination of Colorado Department of Corrections chief Tom Clements. Why is DA Dan May and Sheriff Bill Elder protecting them? DirtyElder.com has written multiple articles about the assassination of Colorado’s DOC (Department of Corrections) Chief Tom Clements. 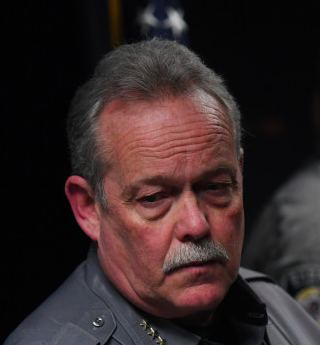 (Read Story1; Read Story2) In these articles we explained how evidence was obtained by EPSO (El Paso County Sheriff’s Office) Detectives showing others were involved with the planning of Tom Clements’ murder. Not only did they help plan the murder, they provided Evan Ebel with assistance to include; money, a cell phone, addresses of victims (kill list), and a place to hide in Texas after the murder. All this evidence proves others were involved with the murder of Tom Clements. The kill list shows Ebel was to kill others he had no “beef’ with, but rather were 211 crew targets. There is clear and convincing evidence others were involved. EPSO investigators gathered evidence to include a full confession from an individual who admitted his complicity in the plot and stated a member of the 211 crew gang told him he ordered the hit. 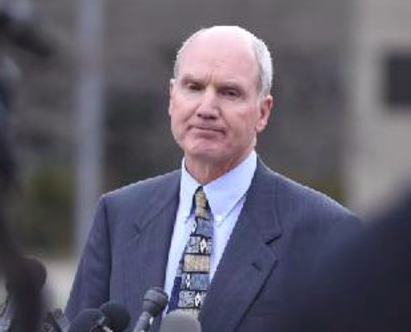 When Detectives presented overwhelming evidence others were involved; DA Dan May told them there was not enough. Detectives knew there was plenty of evidence; so why did Dan May refuse to prosecute? Many suspected it was because Dan May was afraid the 211 crew would kill him. Why didn’t Dan May just present the evidence to a Grand Jury? What could that harm? It would not impact the ongoing investigation. Was he afraid they might actually indict the other conspirators? In previous articles it was suggested Dan May was afraid because investigators learned the 211 crew put a hit on him years earlier but mistakenly killed Sean May in Denver. Read Article. Evidence was provided showing a Texas Ranger working on the Tom Clements homicide asked a CI (confidential informant) if he knew about Sean May’s murder. 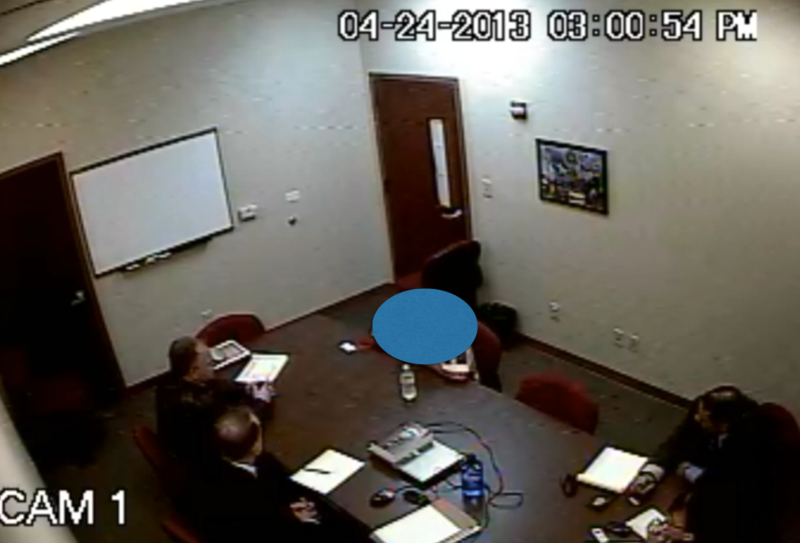 Why would an investigator working on the Tom Clements case ask an informant about Sean May’s murder? Because Dan May asked him to. It’s clear Dan May was concerned about the 211 crew killing him and he was making decisions based on fear. But is there any direct evidence showing EPSO received information concerning a “hit” on Dan May during their investigation? The answer is “yes”. They received multiple letters from a CI within the prison system who was close to the 211 crew gang. Investigators interviewed this person (recorded) multiple times. He provided detailed information concerning the Dan May “hit”. This information was relayed to the District Attorney’s office and ultimately to DA Dan May. Shortly there after May installed armed security within the DA’s office along with barriers and metal detectors. This shows Dan May took the threat serious. 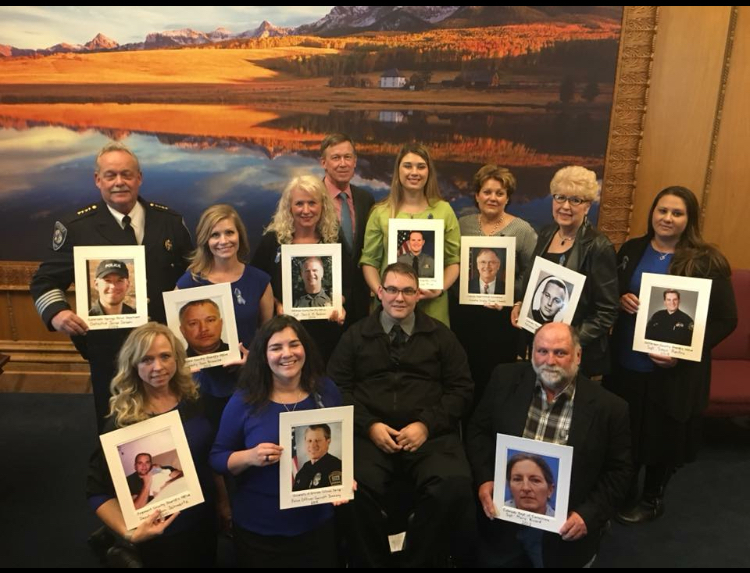 He also removed the (highly qualified) lead prosecutor Jeff Lindsey from the case; stating he was reassigned to a higher priority case; what can be higher priority than the murder of Colorado’s DOC chief? Dan May took over and ensured no charges were brought against the other conspirators. It should also be noted the lead investigator in the Sean May homicide was notified of the information EPSO received. This also shows Dan May and investigators took the information serious. Many hope the others involved in the murder of Tom Clements will be brought to justice. So, releasing the audio recording of the interview with the CI would be inappropriate; however, a highly redacted copy of a letter sent to EPSO from the CI would be appropriate to show Dan May knew about the threat when he blocked all efforts to prosecute those involved with the murder of Tom Clements. Read Redacted Letter. Notice the date of the letter. Investigators knew within days of the murder there were others involved in the murder of Tom Clements. FACT: District Attorney Dan May knew the 211 crew put a “hit” on him and Sean May was mistakenly killed. FACT: Dan May took this threat serious and had enhanced security, to include armed guards, install at the DA’s office. FACT: After Dan May learned of this threat he removed the lead prosecutor (Jeff Lindsey) and took over supervision. FACT: By the direction of the DA’s office, a CI being interviewed in Texas was asked about the Sean May homicide; clearly showing Dan May was aware of the threat and was taking it serious. FACT: When EPSO investigators presented overwhelming evidence (to include a confession) to charge and arrest the others involved; Dan May refused to authorize it. FACT: Dan May let the statute of limitations run out on the crime of accessory, which would have been much easier to prove. May never presented the evidence to a grand jury to see if they would indict on accessory. FACT: There was absolutely nothing to lose in presenting the evidence to a grand jury; yet Dan May never does. FACT: Knowing there is evidence of other conspirators (to include a confession); Dan May does not express any concerns when Sheriff Bill Elder attempts to close the investigation. Read memo. The question you should be asking yourself is this; Why was Dan May willing to do what ever it took, to include going to a Grand Jury, to go after an old political rival; but did nothing to bring the killers of Tom Clements to justice? In fact, he actively obstructed the efforts of investigators. Does this sound Corrupt? Let’s talk about Corrupt Sheriff Bill Elder. The former sheriff and investigators wanted to bring the Killers of Tom Clements to justice and stated there was enough to arrest. 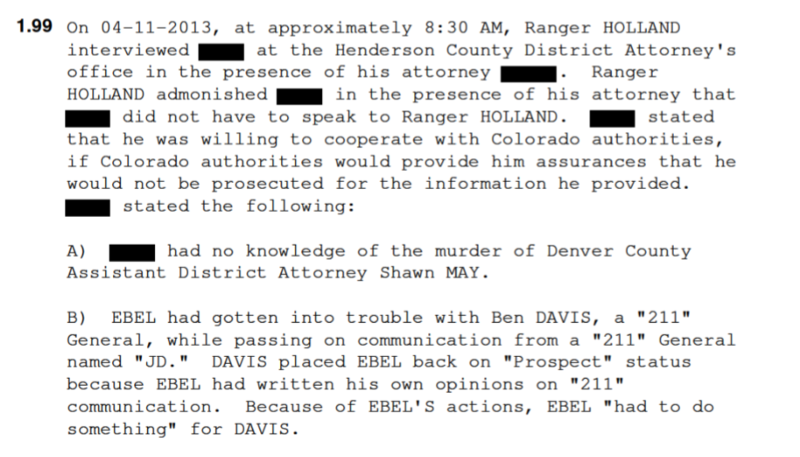 So why does Corrupt Sheriff Bill Elder keep telling the media there is NO evidence to suggest anyone other than Evan Ebel killed Tom Clements? Was the evidence lost? Nope. It is clear Bill Elder is lying. Is it just a coincidence Bill Elder’s wife was recently promoted to supervisor at the DA’s office? DirtyElder.com was told employees at the DA’s office were furious. They stated she did not deserve the promotion and only got it because of her husband. Was this a payoff for Bill Elder Lying and covering for Dan May? This is just more evidence of corruption and collusion. FACT: Based on the evidence obtained during the initial investigation, Detectives and the Sheriff recommended arresting multiple individuals for the murder of Tom Clements. FACT: When Elder becomes Sheriff he tells the media there is NO evidence anyone else was involved in the murder. FACT: It is imposible for there to be enough evidence to arrest and then when Elder takes office there is NO EVIDENCE. To be clear; we are not wanting to release information concerning the Tom Clements homicide. But we feel we have no choice because it is obvious Dan May and Bill Elder are Lying and Corrupt. We are seeking justice for Tom Clements and his family. Elder and May should be investigated for official misconduct, obstruction, and accessory. There was an independent prosecutor for Terry Maketa; how about one for Dan May and Bill Elder? Corrupt Sheriff Bill Elder in a photo OP with Lisa Clements. Elder knows there is evidence others were involved in the murder of Lisa Clement’s husband, but yet he has the audacity to be included in a photo with her. How pathetic. What would Lisa Clements think if she knew what Sheriff Bill Elder and District Attorney Dan May did to protect the killers of her husband.